Porphyria cutanea tarda (PCT) is a term encompassing a group of acquired and familial disorders in which activity of the heme synthetic enzyme uroporphyrinogen decarboxylase (UROD) is deficient. Approximately 80% of all cases of porphyria cutanea tarda are acquired; 20% are familial, although the ratio may vary among different geographic regions and ethnic groups. The common acquired form, sporadic porphyria cutanea tarda, occurs in individuals whose UROD DNA sequences are normal, but who may have other genetically determined susceptibilities to inhibition of UROD activity. Acquired porphyria in large populations exposed to polyhalogenated aromatic hydrocarbon hepatotoxins  has been referred to as "epidemic” porphyria cutanea tarda. Hepatic tumors producing excess porphyrins are rare causes of porphyria cutanea tarda–like disorders. Clinical expression of both sporadic and familial porphyria cutanea tarda most often requires exposure to environmental or infectious agents or the presence of coexisting conditions that adversely affect hepatocytes and result in hepatic siderosis. Ethanol intake, estrogen therapies, hemochromatosis genes, and hepatitis and human immunodeficiency viral infections are among these contributory factors. The increased oxidative stress associated with all of these factors has been shown to reduce hepatic expression of the gene encoding hepcidin, a regulator of iron absorption and metabolism, thus increasing iron absorption and iron overload. Excess iron facilitates formation of toxic oxygen species, thus amplifying porphyrinogenesis by catalyzing formation of oxidative inhibitors of UROD enzyme activity. Accumulating porphyrins in hepatocytes may then further down-regulate hepcidin gene expression. Most patients with porphyria cutanea tarda have increased iron burden; iron-reduction therapies can lead to clinical and biochemical remissions; subsequent reaccumulation of iron stores may lead to symptomatic recurrence. Other porphyria-related Medscape articles include Erythropoietic Porphyria, Protoporphyria, Pseudoporphyria, and Variegate Porphyria. When hepatic UROD activity falls below the critical threshold, porphyrin by-products of the heme biosynthetic pathway with 4-8 carboxyl group substituents are overproduced. These porphyrins are reddish pigments that accumulate in the liver and are disseminated in plasma to other organs. Porphyrins with high carboxyl group numbers are water soluble and excreted primarily by renal mechanisms. The porphyrin with 8 carboxyl groups is termed uroporphyrin; 4-carboxyl porphyrins include coproporphyrin and isocoproporphyrin, which are chiefly excreted in feces. Porphyrins are photoactive molecules that efficiently absorb energy in the visible violet spectrum. Photoexcited porphyrins in the skin mediate oxidative damage to biomolecular targets, causing cutaneous lesions. 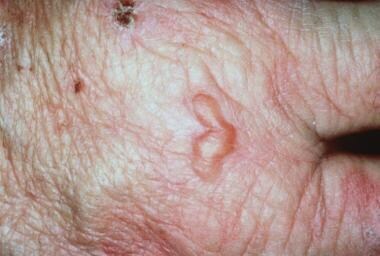 The most common photocutaneous manifestations of porphyria cutanea tarda are due to increased mechanical fragility after sunlight exposure; erosions and blisters form painful indolent sores that heal with milia, dyspigmentation, and scarring (see images below). Thickened skin with blisters, scars, and milia. Courtesy of Dirk Elston, MD. Close-up image of blisters, scarring, and milia. Courtesy of Dirk Elston, MD. The unifying underlying cause of all forms of porphyria cutanea tarda is reduction of UROD activity to a critical point during hepatic heme synthesis. [10, 11, 13] Genetic, environmental or infectious contributory or susceptibility factors, acting singly or more often in concert, [14, 15, 16] inhibit UROD activity to that point of insufficiency, resulting in the onset of clinical symptoms. The role of estrogen in inhibition of UROD activity is not firmly established, it but may be similar to that of alcohol in generating toxic oxygen or inducing cytochromes, thus potentiating uroporphyrinogen oxidation. Hepatitis virus infections are frequently associated with porphyria cutanea tarda. [18, 22, 23, 24] Hepatitis C occurs with a rate of greater than 50% in populations studied in several European countries and in the United States, while in other regions, the concordance is less frequent. Increased hepatic iron often is found in patients with hepatitis C infection. Tobacco smoking is a behavioral characteristic frequently observed among patients with porphyria cutanea tarda. [14, 16] Smoking has been associated with earlier onset of symptoms in sporadic porphyria cutanea tarda, with a putative mechanism involving induction of an hepatic cytochrome that may contribute to oxidation of uroporphyringen,  but evidence for smoking as an independent pathogenic factor is not yet robust. Environmental exposure to aromatic polyhalogenated hepatotoxins also induces hepatic cytochromes, thus potentiating production of oxidation products capable of inhibiting UROD activity. A registry has been established by the NIH-funded Porphyrias Consortium (http://rarediseasesnetwork.epi.usf.edu/registry/direct.htm) to more accurately enumerate cases of various types of porphyrias occurring in the US population. Until sufficient data have been collected by this registry to allow calculation, approximately 1 case of porphyria cutanea tarda in populations of 10,000-25,000 can be estimated based on data from other countries. Porphyria cutanea tarda is the most common porphyria seen in clinical practice. Porphyria cutanea tarda occurs in both sexes. Older reports indicated a great preponderance of porphyria cutanea tarda in men; more recent surveys include many women. 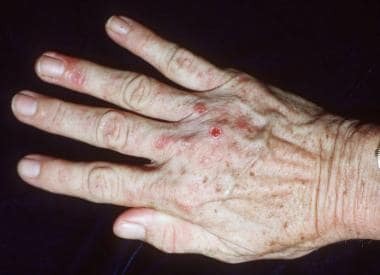 The major morbidity of porphyria cutanea tarda is due to skin fragility and blistering, which preclude manual labor and hamper daily activities. The subsequent erosions represent full-thickness epidermal loss; they are painful and often become thickly crusted and secondarily infected. Healing is slow and leaves pigmentary changes, milia, and atrophic scars. Patients should be educated about the role of sunlight in eliciting the skin lesions and in methods of sunlight avoidance. Because porphyrins absorb radiant energy most efficiently at very long ultraviolet and visible light wavelengths, topical sunscreens must contain ingredients that either scatter or block long ultraviolet and visible light rays to offer any practical protection. Use of light-exclusive clothing and lifestyle alterations are usually necessary to alleviate photocutaneous reactions until remissions can be achieved. The need to avoid iron-containing dietary supplements, alcohol, and smoking should be stressed. Dietary iron is not usually a major problem and can be managed with moderation in consumption of red meats, but some patients may benefit from guidance about the iron content of foods from a nutritionist. Adequate dietary vitamin C should be consumed. Kappas A, Sassa S, Galbraith RA, et al. The porphyrias. CR Scriver, et al, eds. The Metabolic Basis of Inherited Disease. New York, NY: McGraw-Hill; 1995. 2103-59. Dubart A, Mattei MG, Raich N, Beaupain D, Romeo PH, Mattei JF. Assignment of human uroporphyrinogen decarboxylase (URO-D) to the p34 band of chromosome 1. Hum Genet. 1986 Jul. 73(3):277-9. [Medline]. Moran-Jimenez MJ, Ged C, Romana M, et al. Uroporphyrinogen decarboxylase: complete human gene sequence and molecular study of three families with hepatoerythropoietic porphyria. Am J Hum Genet. 1996 Apr. 58(4):712-21. [Medline]. [Full Text]. Elder GH, Roberts AG, de Salamanca RE. Genetics and pathogenesis of human uroporphyrinogen decarboxylase defects. Clin Biochem. 1989 Jun. 22(3):163-8. [Medline]. Mendez M, Poblete-Gutierrez P, Garcia-Bravo M, et al. Molecular heterogeneity of familial porphyria cutanea tarda in Spain: characterization of 10 novel mutations in the UROD gene. Br J Dermatol. 2007 Sep. 157(3):501-7. [Medline]. Cam C, Nigogosyan G. Acquired toxic porphyria cutanea tarda due to hexachlorobenzene. Report of 348 cases caused by this fungicide. JAMA. 1963 Jan 12. 183:88-91. [Medline]. Ajioka RS, Phillips JD, Weiss RB, Dunn DM, Smit MW, Proll SC. Down-regulation of hepcidin in porphyria cutanea tarda. Blood. 2008 Dec 1. 112(12):4723-8. [Medline]. Bonkovsky HL, Lambrecht RW, Shan Y. Iron as a co-morbid factor in nonhemochromatotic liver disease. Alcohol. 2003 Jun. 30(2):137-44. [Medline]. Phillips JD, Bergonia HA, Reilly CA, Franklin MR, Kushner JP. A porphomethene inhibitor of uroporphyrinogen decarboxylase causes porphyria cutanea tarda. Proc Natl Acad Sci U S A. 2007 Mar 20. 104(12):5079-84. [Medline]. [Full Text]. Kushner JP, Barbuto AJ, Lee GR. An inherited enzymatic defect in porphyria cutanea tarda: decreased uroporphyrinogen decarboxylase activity. J Clin Invest. 1976 Nov. 58(5):1089-97. [Medline]. [Full Text]. Elder GH, Lee GB, Tovey JA. Decreased activity of hepatic uroporphyrinogen decarboxylase in sporadic porphyria cutanea tarda. N Engl J Med. 1978 Aug 10. 299(6):274-8. [Medline]. Grossman ME, Bickers DR, Poh-Fitzpatrick MB, Deleo VA, Harber LC. Porphyria cutanea tarda. Clinical features and laboratory findings in 40 patients. Am J Med. 1979 Aug. 67(2):277-86. [Medline]. Elder GH, Roberts AG. Uroporphyrinogen decarboxylase. J Bioenerg Biomembr. 1995 Apr. 27(2):207-14. [Medline]. Egger NG, Goeger DE, Payne DA, Miskovsky EP, Weinman SA, Anderson KE. Porphyria cutanea tarda: multiplicity of risk factors including HFE mutations, hepatitis C, and inherited uroporphyrinogen decarboxylase deficiency. Dig Dis Sci. 2002 Feb. 47(2):419-26. [Medline]. Cruz-Rojo J, Fontanellas A, Moran-Jimenez MJ, et al. Precipitating/aggravating factors of porphyria cutanea tarda in Spanish patients. Cell Mol Biol (Noisy-le-grand). 2002 Dec. 48(8):845-52. [Medline]. Jalil S, Grady JJ, Lee C, Anderson KE. Associations among behavior-related susceptibility factors in porphyria cutanea tarda. Clin Gastroenterol Hepatol. 2010 Mar. 8(3):297-302, 302.e1. [Medline]. [Full Text]. Elder GH. Alcohol intake and porphyria cutanea tarda. Clin Dermatol. 1999 Jul-Aug. 17(4):431-6. [Medline]. Bonkovsky HL, Poh-Fitzpatrick M, Pimstone N, et al. Porphyria cutanea tarda, hepatitis C, and HFE gene mutations in North America. Hepatology. 1998 Jun. 27(6):1661-9. [Medline]. Edwards CQ, Griffen LM, Goldgar DE, Skolnick MH, Kushner JP. HLA-linked hemochromatosis alleles in sporadic porphyria cutanea tarda. Gastroenterology. 1989 Oct. 97(4):972-81. [Medline]. Toll A, Celis R, Ozalla MD, Bruguera M, Herrero C, Ercilla MG. The prevalence of HFE C282Y gene mutation is increased in Spanish patients with porphyria cutanea tarda without hepatitis C virus infection. J Eur Acad Dermatol Venereol. 2006 Nov. 20(10):1201-6. [Medline]. Lambrecht RW, Bonkovsky HL. Hemochromatosis and porphyria. Semin Gastrointest Dis. 2002 Apr. 13(2):109-19. [Medline]. Stransky J, Malina L, Cieslarova B, Stritesky J, Putova I, Horak J. Overt and hidden coinfection with hepatitis B and C viruses in chronic liver disease and porphyria cutanea tarda. Acta Virol. 2000 Feb. 44(1):23-8. [Medline]. Oubina JR, Quarleri JF, Sawicki MA, et al. Hepatitis C virus and GBV-C/hepatitis G virus in Argentine patients with porphyria cutanea tarda. Intervirology. 2001. 44(4):215-8. [Medline]. Hift RJ, Meissner PN, Todd G. Hepatoerythropoietic porphyria precipitated by viral hepatitis. Gut. 1993 Nov. 34(11):1632-4. [Medline]. [Full Text]. Gisbert JP, Garcia-Buey L, Pajares JM, Moreno-Otero R. Prevalence of hepatitis C virus infection in porphyria cutanea tarda: systematic review and meta-analysis. J Hepatol. 2003 Oct. 39(4):620-7. [Medline]. Blauvelt A, Harris HR, Hogan DJ, Jimenez-Acosta F, Ponce I, Pardo RJ. Porphyria cutanea tarda and human immunodeficiency virus infection. Int J Dermatol. 1992 Jul. 31(7):474-9. [Medline]. Mansourati FF, Stone VE, Mayer KH. Porphyria cutanea tarda and HIV/AIDS: a review of pathogenesis, clinical manifestations and management. Int J STD AIDS. 1999 Jan. 10(1):51-6. [Medline]. Fontanellas A, Martinez-Fresno M, Garrido-Astray MC, et al. Smoking but not homozygosity for CYP1A2 g-163A allelic variant leads to earlier disease onset in patients with sporadic porphyria cutanea tarda. Exp Dermatol. 2010 Feb 16. [Medline]. Badenas C, To-Figueras J, Phillips JD, Warby CA, Munoz C, Herrero C. Identification and characterization of novel uroporphyrinogen decarboxylase gene mutations in a large series of porphyria cutanea tarda patients and relatives. Clin Genet. 2009 Apr. 75(4):346-53. [Medline]. Christiansen L, Brøns-Poulsen J, Horder M, Brock A, Petersen NE. Expression and characterization of six clinically relevant uroporphyrinogen decarboxylase gene mutations. Scand J Clin Lab Invest. 2005. 65(3):227-35. [Medline]. Poblete-Gutierrez P, Mendez M, Wiederholt T, et al. The molecular basis of porphyria cutanea tarda in Chile: identification and functional characterization of mutations in the uroporphyrinogen decarboxylase gene. Exp Dermatol. 2004 Jun. 13(6):372-9. [Medline]. Succi IB, Pôrto LC, Silva D, Nascimento A, Neto RC, Fonseca JC. SLC40A1 and CP single nucleotide polymorphisms in porphyria cutanea tarda patients of mixed ancestry. Ann Hum Genet. 2018 May 17. [Medline]. Elder GH. Hepatic porphyrias in children. J Inherit Metab Dis. 1997 Jun. 20(2):237-46. [Medline]. Elder GH, Smith SG, Herrero C, et al. Hepatoerythropoietic porphyria: a new uroporphyrinogen decarboxylase defect or homozygous porphyria cutanea tarda?. Lancet. 1981 Apr 25. 1(8226):916-9. [Medline]. Toback AC, Sassa S, Poh-Fitzpatrick MB, et al. Hepatoerythropoietic porphyria: clinical, biochemical, and enzymatic studies in a three-generation family lineage. N Engl J Med. 1987 Mar 12. 316(11):645-50. [Medline]. Armstrong DK, Sharpe PC, Chambers CR, Whatley SD, Roberts AG, Elder GH. Hepatoerythropoietic porphyria: a missense mutation in the UROD gene is associated with mild disease and an unusual porphyrin excretion pattern. Br J Dermatol. 2004 Oct. 151(4):920-3. [Medline]. Gisbert JP, Garcia-Buey L, Alonso A, et al. Hepatocellular carcinoma risk in patients with porphyria cutanea tarda. Eur J Gastroenterol Hepatol. 2004 Jul. 16(7):689-92. [Medline]. Dawe R. An overview of the cutaneous porphyrias. F1000Res. 2017. 6:1906. [Medline]. Campos S, Lencastre A. sQuiz your knowledge: Expanding scarring alopecia in a patient with porphyria cutanea tarda. Eur J Dermatol. 2017 Apr 1. 27 (2):222-223. [Medline]. Sinclair PR, Gorman N, Shedlofsky SI, et al. Ascorbic acid deficiency in porphyria cutanea tarda. J Lab Clin Med. 1997 Aug. 130(2):197-201. [Medline]. Tatsumi C, Kudo M, Ueshima K, et al. Noninvasive evaluation of hepatic fibrosis using serum fibrotic markers, transient elastography (FibroScan) and real-time tissue elastography. Intervirology. 2008. 51 Suppl 1:27-33. [Medline]. Epstein JH, Tuffanelli DL, Epstein WL. Cutaneous changes in the porphyrias. A microscopic study. Arch Dermatol. 1973 May. 107(5):689-98. [Medline]. Fung MA, Murphy MJ, Hoss DM, Berke A, Grant-Kels JM. The sensitivity and specificity of "caterpillar bodies" in the differential diagnosis of subepidermal blistering disorders. Am J Dermatopathol. 2003 Aug. 25(4):287-90. [Medline]. Wolff K, Honigsmann H, Rauschmeier W, Schuler G, Pechlaner R. Microscopic and fine structural aspects of porphyrias. Acta Derm Venereol Suppl (Stockh). 1982. 100:17-28. [Medline]. Lefkowitch JH, Grossman ME. Hepatic pathology in porphyria cutanea tarda. Liver. 1983 Feb. 3(1):19-29. [Medline]. Ippen H. Treatment of porphyria cutanea tarda by phlebotomy. Semin Hematol. 1977 Apr. 14(2):253-9. [Medline]. Ramsay CA, Magnus IA, Turnbull A, Baker H. The treatment of porphyria cutanea tarda by venesection. Q J Med. 1974 Jan. 43(169):1-24. [Medline]. Poh-Fitzpatrick MB, Honig PJ, Kim HC, Sassa S. Childhood-onset familial porphyria cutanea tarda: effects of therapeutic phlebotomy. J Am Acad Dermatol. 1992 Nov. 27(5 Pt 2):896-900. [Medline]. Ratnaike S, Blake D, Campbell D, Cowen P, Varigos G. Plasma ferritin levels as a guide to the treatment of porphyria cutanea tarda by venesection. Australas J Dermatol. 1988 Apr. 29(1):3-8. [Medline]. Fernandez I, Castellano G, de Salamanca RE, et al. Porphyria cutanea tarda as a predictor of poor response to interferon alfa therapy in chronic hepatitis C. Scand J Gastroenterol. 2003 Mar. 38(3):314-9. [Medline]. Taljaard JJ, Shanley BC, Stewart-Wynne EG, Deppe WM, Joubert SM. Studies on low dose chloroquine therapy and the action of chloroquine in symptomatic porphyria. Br J Dermatol. 1972 Sep. 87(3):261-9. [Medline]. Kordac V, Semradova M. Treatment of porphyria cutanea tarda with chloroquine. Br J Dermatol. 1974 Jan. 90(1):95-100. [Medline]. Battle AM, Stella AM, De Kaminsky AR, Kaminsky C, Mariano HG. Two cases of infantile porphyria cutanea tarda: successful treatment with oral S-adenosyl-L-methionine and low-dose oral chloroquine. Br J Dermatol. 1987 Mar. 116(3):407-15. [Medline]. Bruce AJ, Ahmed I. Childhood-onset porphyria cutanea tarda: successful therapy with low-dose hydroxychloroquine (Plaquenil). J Am Acad Dermatol. 1998 May. 38(5 Pt 2):810-4. [Medline]. Stolzel U, Kostler E, Schuppan D, et al. Hemochromatosis (HFE) gene mutations and response to chloroquine in porphyria cutanea tarda. Arch Dermatol. 2003 Mar. 139(3):309-13. [Medline]. Singal AK, Kormos-Hallberg C, Lee C, Sadagoparamanujam VM, Grady JJ, Freeman DH Jr. Low-dose hydroxychloroquine is as effective as phlebotomy in treatment of patients with porphyria cutanea tarda. Clin Gastroenterol Hepatol. 2012 Dec. 10(12):1402-9. [Medline]. Seubert S, Seubert A, Stella AM, Guzman H, Batlle A. [Results of treatment of porphyria cutanea tarda with bloodletting and chloroquine]. Z Hautkr. 1990 Mar. 65(3):223-5. [Medline]. Rocchi E, Cassanelli M, Borghi A, et al. Liver iron overload and desferrioxamine treatment of porphyria cutanea tarda. Dermatologica. 1991. 182(1):27-31. [Medline]. Pandya AG, Nezafati KA, Ashe-Randolph M, Yalamanchili R. Deferasirox for porphyria cutanea tarda: a pilot study. Arch Dermatol. 2012 Aug. 148(8):898-901. [Medline]. Anderson KE, Goeger DE, Carson RW, Lee SM, Stead RB. Erythropoietin for the treatment of porphyria cutanea tarda in a patient on long-term hemodialysis. N Engl J Med. 1990 Feb 1. 322(5):315-7. [Medline]. Ryan Caballes F, Sendi H, Bonkovsky HL. Hepatitis C, porphyria cutanea tarda and liver iron: an update. Liver Int. 2012 Jul. 32 (6):880-93. [Medline]. Loret de Mola JR, Muise KL, Duchon MA. Porphyria cutanea tarda and pregnancy. Obstet Gynecol Surv. 1996 Aug. 51(8):493-7. [Medline]. Agarwal R, Peters TJ, Coombes RC, Vigushin DM. Tamoxifen-related porphyria cutanea tarda. Med Oncol. 2002. 19(2):121-3. [Medline]. Poh-Fitzpatrick MB, Bellet N, DeLeo VA, Grossman ME, Bickers DR. Porphyria cutanea tardia in two patients treated with hemodialysis for chronic renal failure. N Engl J Med. 1978 Aug 10. 299(6):292-4. [Medline]. Rodrigues N, Caeiro F, Santana A, Mendes T, Lopes L. Porphyria Cutanea Tarda in a Patient with End-Stage Renal Disease: A Case of Successful Treatment with Deferoxamine and Ferric Carboxymaltose. Case Rep Nephrol. 2017. 2017:4591871. [Medline]. Ewing S, Crosby DL. Renal transplantation for porphyria cutanea tarda. N Engl J Med. 1997 Mar 13. 336(11):811. [Medline]. Stevens BR, Fleischer AB Jr, Piering F, Crosby DL. Porphyria cutanea tarda in the setting of renal failure. Response to renal transplantation. Arch Dermatol. 1993 Mar. 129(3):337-9. [Medline]. Subepidermal bulla, festooning of rete ridges, hyalinization of blood vessel walls, solar elastosis, and caterpillar bodies. Courtesy of Dirk Elston, MD. Fluorescence of urine with a Wood light examination. Courtesy of Brooke Army Medical Center Teaching File. Disclosure: Serve(d) as a director, officer, partner, employee, advisor, consultant or trustee for: American Board of Dermatology<br/>Co-Editor for the text Dermatological Manifestations of Kidney Disease .